Summary of bird records for 2017 from Beachy Head. These records have been compiled by JFC from his own and a few reliable local observers records, and with special thanks to Bob Edgar for his detailed reports from Whitbread Hollow. Unfortunately, I have only received a few details for Hodcombe which I have included in this summary and therefore the majority of the migrant numbers which pass through Hodcombe are not included in this summary. Sea-watching during the 1970's and 80's were carried out by a number of dedicated observers over many hours often lasting all day, with often double figures of observers watching during the week-ends. With the loss of the sea-watching hut, we only now have 2-3 observers regularly watching during the Spring, and usually only for part of the morning. Also the few observers we have are now OAP's, including myself, with our eye-sight now deteriorating. We were able to pick out Little Gulls and Little Terns moving past some way out a few years ago, but sadly now the majority of these now slip through unrecorded. 2017 Jan-Feb: Recorded on 11 dates from 17/1 4 to 24/2 (1). A total of 911 E with daily maxs: 14/2 403 E, 15/2 110 E and 16/2 153 E. A number of birds were also seen sat on the sea or moving W, but are not included in the above totals. The 14/2 is our second highest daily total since 1960. 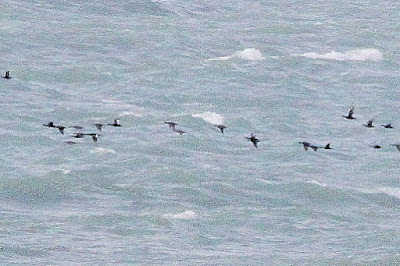 2017: Jan-Feb: 3/2 1 w/p E @ 07.30 (close in with 1 Red-throated diver), 13/2 (1 possible E), and 14/2 1 E @ 08.25 (Close with 6 RT Divers). 2017: Jan-Feb: Recorded on 10 dates with a daily max: 14 Feb 32 (7 E and 25 on the sea including party of 13). 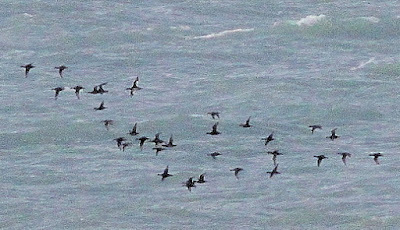 Spring: March up to 12 seen on the sea off Birling, but then numbers declined with only 4 seen on the sea off Birling during May. Per B.H.log. Spring sea-watches; Max. movements: 30/4 160 E, 12/5 277 E. and 10/6 185E & 22 W.
Our highest daily total was recorded on the 3/1/1965 when a party of 21 moved East. 2017: Jan-Feb 3/1 (1) and 20/1 (1). Little Egrets were first recorded from Beachy Head on the 11/5/1991. We have had 4 previous records, with one probable. Spring recorded on 4 dates: 14/3 and 15/3 1 at Birling, 12/5 2 soaring over B/T and 29/5 2 soaring high over Cornish farm. Autumn: Just single birds seen on a few dates. One present in the set-a-side field near Birling. 2017: 2/9 2 high over Whitbread Hollow drifted off N at 10.20 (RDME et al) probably were introduced birds by the Knepp Estate who now have a number of free flying birds. Per B.H.Log. Two previous records from Beachy Head of singles in 1976 and 1986. 2017: Jan-Feb: Recorded on 6 dates from 17/1 (7E) to 18/2 (240E) A total of 718 E with a daily max: 15/2 315E and 18/2 240E. 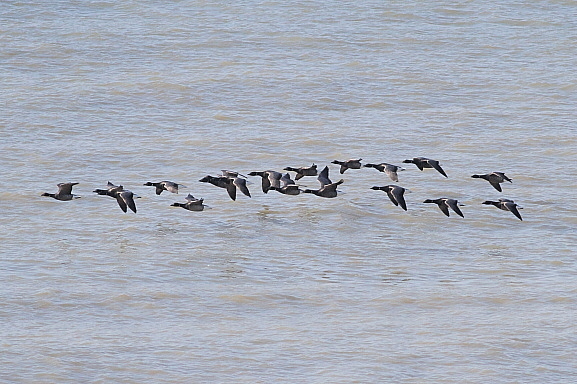 Brent Geese moving off Birling. Our 11th record since 1960 Per B.H.Log. 2017: 1/2: 2 circled Birling Gap in the fog at 10.30 (LP). 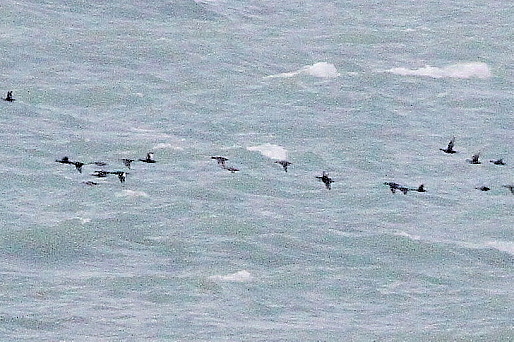 Our 3rd record for Beachy Head. 2017: Jan-Feb: Just a single bird E on the 16/2. 2017 Jan-Feb: 25/1 (2E), 15/2 8E and 18/2 (7E). 2017: Spring sea-watches: 30/3 2E and 9/4 4 E. Per B.H.Log. 2017: Spring sea-watches: Recorded on four dates: 11/3 1 E, 8/4 8E, 9/4 17 E and 23/4 3 E.
2017; Spring sea-watches: Recorded on 4 dates from 22/3 to the 30/4 with a total of 14 E.
2017: Spring sea-watches: 9/4 A party of 10 E.
2017: A party of 8E with Common Scoters on the 28/3. Per B.H.Log. Our 18th record since regular recording commenced in 1960. Per B.H.log. 2017:Spring sea-watches: A total of 43 with 24 Feb 4 E @ 07.45 (1 sub ad male and 3 females), 14 Mar 10 E (7 drakes, 2 sub adults and 1 female), 28 Mar 2 on the sea (pair), 29 Mar 7 E (3 males, 1 sub-male and 3 females), 30 Apr 1 female E, 1 May 19 (flock of 18 E and 1 on the sea) . After two poor years in 2015 and 2016 it was good news that a larger passage was noted this year. Our best year was in 1982 when 202 were logged on the spring sea-watches. Per B.H.Log. 2017: Jan-Feb: Recorded on 7 dates from 3/1 (3W) to 24/2 (39 E). A total of 100 E during this period. Spring Sea-watches: Recorded on 32 dates with a total of 7,208 E from 7/3 to 10/6 (61E). Daily maxs: 28/3 2019 E, 9/4 1,072, 29/4 1052. Per B.H.Log. Our best Spring movement occurred in 1979 when a total of 19,319 moved E with an unprecedented peak of 13,293 E on 8/4/1979. 2017: Spring sea-watches: Recorded on 8 dates from 15/2 (1 E) to 12/5 (4E). A total of 133 E with daily maxs: 28/3 56 E (parties: 2,1,10,18,9,8,8), 9/4 27 E (parties: 1,1,5,13,4,3), 24/4 21 E (parties: 2,2,15,2), 30/4 15 E.
Our best Spring total this century. Per B.H.Log. 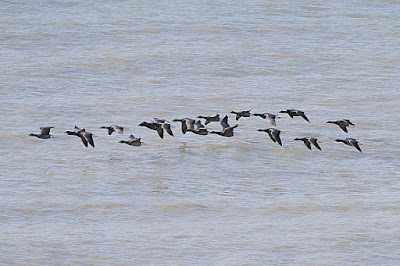 Velvet and Common Scoters moving past Birling. 2017:Spring sea-watches: Recorded on on just five dates: 18/2 3E., 27/3 2E, 28/3 7E, 8/4 2E and 9/4 2E. A total of just 16 E.
Our worst Spring to date. Per B.H.Log.